family pictures and merry christmas! kevin surprised me with a new north face coat. i love it! the aftermath...so blessed and so fun! the boys got just what they asked for PLUS some. they were thrilled. wesley had been begging for a "batman cage". and owen had been begging for a dragon castle. santa brought madalyn the cutest snow white doll. not sure if she loves it...BUT, she will if her mother has anything to do with it. and you get a little peek at the pj's kevin gave me. he did a good job. o' christmas tree! the great thing about having six extra people at your home for christmas is your tree becomes incredibly stocked with presents. i love seeing a "well-endowed" tree. and all the stockings...SO FUN! oh, i am feeling so behind lately. so i won't be telling too many stories....just documenting with pictures. kevin's family spent christmas at our home. it was so fun to host them during such a magical holiday! his parents drove from illinois to spend some time with everyone. they ended up staying at our house the 24th through 27th. staci and kyle came from rexburg and stayed the 23rd-27th and rosanne and laura came from utah and stayed the 24th through the 27th! so our home was bursting at the seams! we opened our new pj's on christmas eve (thanks grandma and grandpa manwaring). wesley was so wiped out we couldn't even get him to open his present. but, when he woke up christmas morning he was excited to see his new jammies. owen LOVED his dinosaur pj's. and grandma and grandpa ward were able to meet madalyn for the FIRST time! i loved this picture of carolyn holding madalyn. madalyn and grandpa were able to spend a lot of time together. and he was really great at keeping madalyn stocked with wrapping paper. madalyn in her new pj's. she loves them! she also started sitting up on her own during christmas break. such a cutie! we were able to get some pictures of santa's loot shortly after he came. the boys must have been pretty good! tonight we "officially" started our christmas celebrating! after church we pulled out the gingerbread house kit and we let the boys put together their first gingerbread house. then, about 20 minutes later it became our christmas treat...after it collapsed! then, we jumped in the car and took a drive around idaho falls to see the christmas lights. we are lucky because our neighbors happen to put on the best light show we've seen. then, it was back home for some hot cocoa and watched polar express. don't you just love my red colored hands? gingerbread houses...gotta love them. one thing i wasn't able to get done was finding christmas outfits for all my kids to wear to church. i tried putting wesley in a christmas vest that once belonged to owen...but, wesley insisted that wasn't his church clothes and wanted to wear his white shirt and tie. and i had NO LUCK finding owen a cool tie or sweater. so, madalyn was the only one who went to church today in a christmas outfit. but, she was so ADORABLE i had to take a few pictures. we had our family pictures taken earlier this month, just in time for our christmas cards. a friend, amber vest, did them for us. the only time we were able to make it work was at 7:30 at night...so my kids weren't their smiliest...but, with three kids we take what we can get. amber did a great job for us and i plan on going back to her next year. and while i'm at it i will go ahead and throw my christmas news letter on as well. wishing you all a merry christmas! Merry Christmas from the Wards! Another year has come and gone. We enjoyed a lot of time with family, friends, vacations, and celebrations. Kevin and I both celebrated our 31st birthday this year and 7 years of marriage. Kevin is staying busy with his jobs. 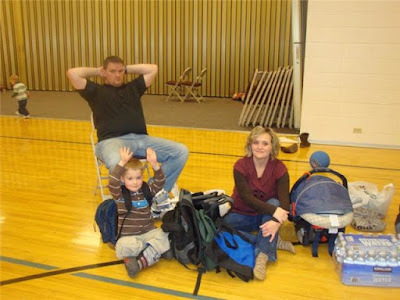 He works full-time at Mountain View Physical Therapy in Idaho Falls. Then he also does a little work at Idaho Falls Care and Rehab each week. He works hard to keep us comfortable. Kevin is also serving in the Elders Quorum Presidency at church & enjoys the opportunities this calling gives him to become acquainted with families in our ward. Becky stays busy with the kids and is grateful that she is allowed to stay home with them. She is also still working from home as office manager for her brothers companies, Scion Computers Systems and Manwaring Web Solutions. Becky was called to serve as the Relief Society pianist in our new ward. She hasn’t played the piano in several years and is very intimidated by this calling and is relying HEAVILY on the Lord to turn her into a talented piano player. She has already improved and is VERY thankful for the keyboard her mother-in-law gave to her several years ago. It has been dusted off and is getting much use. She practices every day and feels like each Sunday is a piano recital. Owen turned 4 in July. He is constantly looking forward to any reason to celebrate...birthdays, holidays, vacations, & Fridays. He loves to spend time with his cousins. Owen begins each day by asking me “what’s the deal?” or in other words, what’s the plan for the day. Owen wants to know the who, what, where, & why’s about everything. He never tires of learning new things. He is SO CURIOUS & smart. He started preschool this fall & enjoys learning. He really enjoys drawing pictures of people & cutting with scissors. Wesley turned 2 in May. He is a very smart & talkative little man. He melts everyone’s hearts with his big brown eyes & long full eyelashes. Wesley enjoys going to Nursery at church. This year we bought him a white shirt & tie to wear to church & each Sunday when he gets dressed he loves to point out that he has a white shirt and tie just like his dad & big brother. He is very particular about his hair and has to have it combed perfectly. Once it’s combed, if anyone touches it or if he rubs his head against something, than he insists that I comb it again…reminds me a little of his Uncle Justin that way. J He loves to play with trains & airplanes. He also imitates the sounds of guns & flying planes REALLY well. Madalyn Jane was born on July 9th. We REALLY enjoy having a little girl in our home. 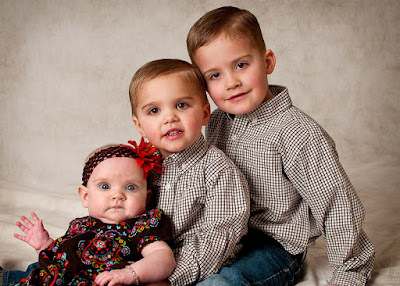 The boys just adore her and love when she wakes up each morning and they are able to give her kisses and ask her if she slept well. They are also very cute about complimenting her on her outfits and accessories each time I get her dressed. They will be great husbands one day if they keep that up. Madalyn is growing up so fast and it seems like she learns something new every day. She is rolling all over the place and prefers to play on her tummy. She loves watching her brothers play and gets excited when they include her in the fun. She has the greatest smile and giggle! We love our little princess! We hope that you all have enjoyed a year full of love, peace, and growth! We look forward to hearing how you have been. We are so thankful for our good friends and family. We certainly would be lost and lonely without you. We love this time of year as it allows us all to catch-up with loved ones, serve one another, and reflect on the many blessings our Heavenly Father has afforded us. We know we would have nothing without Him and our Savior Jesus Christ. We love you all and wish you a Merry Christmas and Happy New Year! i forgot to blog about another activity we did over thanksgiving day. each year my siblings rotate through the different families for our christmas gift exchange. well, this year, instead of exchanging "gifts" we decided to each bring items that we could put in our 72-hour emergency kits. we were each told to bring a backpack for every family member and given a list of suggested items to include in the kit (i grabbed this from my friend's, corin's, blog. THANKS CORIN for inspiring us!). then, each family selected an item and provided it for each individual. i may have forgotten a few items...sorry. 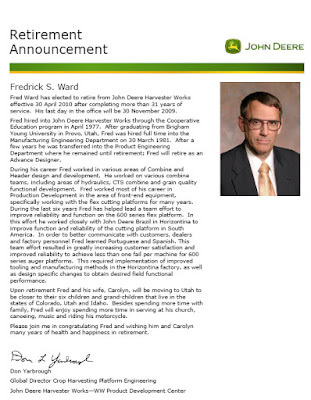 after 31 years with john deere, kevin's dad is retiring! we are proud of his career and really enjoyed reading this announcement and wanted to share it and have it in our book. we are so excited for fred and carolyn to move closer to us so we can see them more than twice a year! ps click on the image to make larger.